IAU students are required to pass the USMLE Step 1 exam before the end of the bridge semester. Once this is completed they may begin clinical rotations in the U.S. The 3rd and 4th years of medical school consist of the Clinical Sciences and are mainly comprised of clinical rotations (clerkships) under the supervision of a physician (preceptor). Our Clinical Campus is located in Baltimore, Maryland, USA, and all affiliated hospitals have ACGME accredited residency programs. 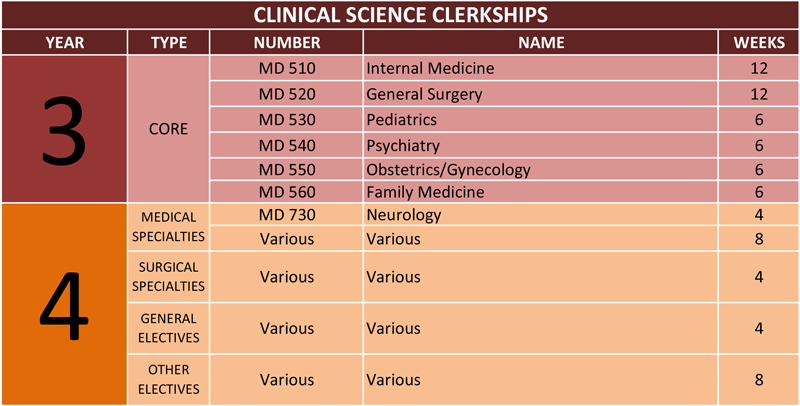 Students must complete a total of forty-eight (48) weeks of core clerkships plus an additional twenty-eight (28) weeks of elective clerkships. Elective rotation details will be made available at the time of scheduling. In addition to completing clerkships during these final two years of the M.D. program, students also prepare for Step 2 CK (Clinical Knowledge) and Step 2 CS (Clinical Skills) of the USMLE, both of which must be passed before the M.D. degree is conferred.